Condition soil, improves aeration, water retention and drainage in heavy soils. Suitable for planter beds, vegetable plots and all soil types. Spread evenly across soil 25mm to 50mm deep. In winter spread on soil to allow the frost to break it down into the soil. The nutrients will wash in over the winter. 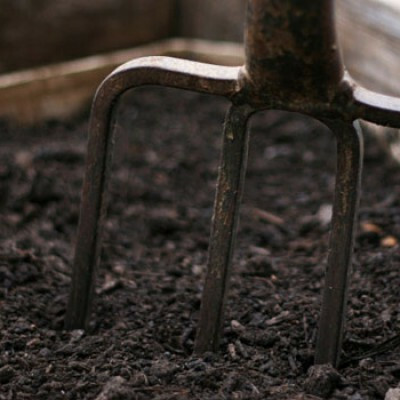 Spring, Summer and Autumn lightly dig into the soil with a fork or shovel. If planting vegetables allow 3 weeks before setting out plugs or seeds. For annual fertilisation add 10% per volume. For very poor soil/clay add 30% per volume. Made from composted grass, leaves, hedges & green material over a 14-20 week period. 100% Renewable and 100% Peat-Free reducing the impact on the environment. Made to the 2011 Compost Standard: IS441. Provides macro and micro nutrients that are essential for healthy plant growth. Nitrogen 4000 mg/L; Phosphorous 800mg/L; Potassioum 1400 mg/L; Magnesium 800 mg/L; Calcium 7000 mg/L; Sulphur 500 mg/L.